Packaging printing on film substrates of any thickness, plastic and aluminium, printing press, books, clothes, labels and folding cartons, printed paper for the purpose of bags, special clothing, pennants, T-shirts, credit cards. Flexographic printing is a technique of relief printing using fast-drying liquid ink. Paint is transferred by the photopolymer form of rubber or plastic, which, in both versions may be manufactured in CTP systems or conventional technique. Printing is done directly on a sheet of corrugated board printing form arranged in a mirror image. The history of the flexographic printing dates back to 1853, when the USA built the first plate to the rotary machine. Initially used in the flexography ink from dyes that are currently considered insufficiently perfect. Currently used in the flexography inks have very good adhesion and the ability to rapidly evaporate or fast curing UV to print, which means flexographic printing is willingly used in the packaging industry. 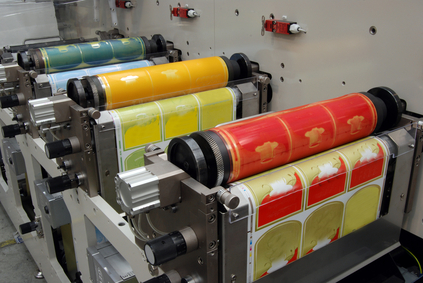 Due to the type of paint used flexography can be divided into three main groups: water, UV and solvent. In the production of self-adhesive labels, the most popular are printing method using the UV inks systems.